An idea campaign? 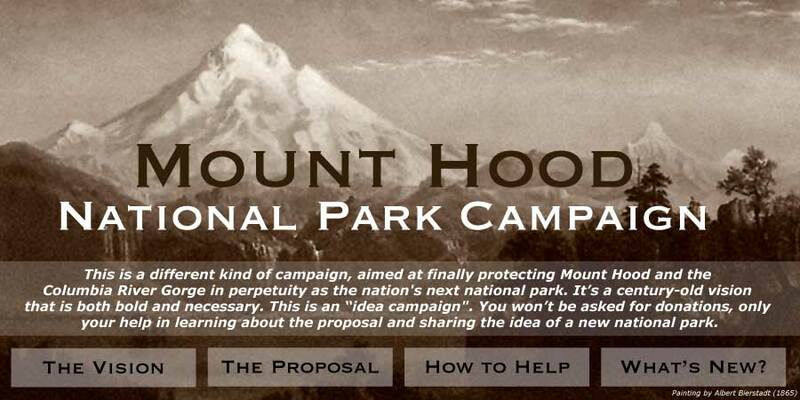 This campaign asks that you simply learn about the proposal from this web site, and lend your support by sharing the idea of a national park with family, friends, community groups and your elected officials. Simply browse the How to Help section for more on how you can get involved in helping restore the legacy of Mount Hood and the Columbia Gorge for future generations. 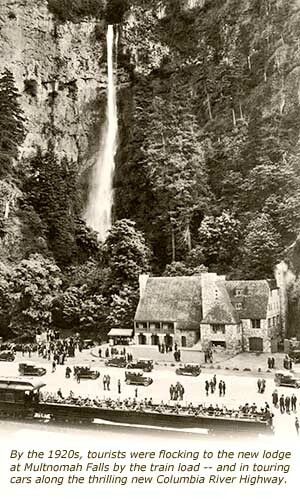 To learn more about the historical context of the proposal, and the case for protecting the mountain and gorge as a national park, read the The Vision section. To learn about more specific proposals for restoring the mountain and gorge, and making these places more accessible to future generations, browse The Proposal section. For more background information, including news accounts, technical reports and blog essays on issues affecting the mountain and gorge, read the What's New section. Why is our mountain in trouble? Mount Hood and the Oregon side of the Columbia Gorge are presently administered as part of the Mount Hood National Forest, under the U.S. Department of Agriculture. For more than a century, the failed USDA mission of attempting to simultaneously protect and exploit the mountain's resources has left much of the natural environment in tatters. Since the 1950s, thousands of miles of logging roads have been cut into the mountains and canyons, tens of thousands of acres of ancient forest have been logged, and hundreds of miles of trails abandoned to make way for industrial forestry. Under this failed Forest Service approach, each new proposal to exploit the mountain is settled as a compromise between these conflicting missions, guaranteeing that the natural and cultural legacy is eroded with each management decision. The current proposals to build off-road vehicle playgrounds in pristine forest areas, and clearcut a 50-mile swath for a natural gas pipeline are just the latest in this string of disastrous compromises. The cummulative effect of Forest Service management over the years has been devastating. Though these management techniques are now generally accepted as destructive and unsustainable, there is no clear mandate for the USDA to restore the lands that they have helped to destroy. Meanwhile, dwindling timber receipts have dropped the bottom out of Forest Service recreation funding, as coping with the enormous backlog of failing logging roads and sickly unhealthy plantations on old clearcuts will consume national forest budgets for decades to come. So why a National Park? It's certainly true that not every National Forest is worthy of National Park status, but Mount Hood and the Columbia Gorge are special. These are places of world-class scenic and geological significance, and are of a caliber that is easily comparable to the finest national parks in the country. In fact, they already compete with the major national parks as destinations, ranking with places like Yellowstone and Yosemite in visitation. 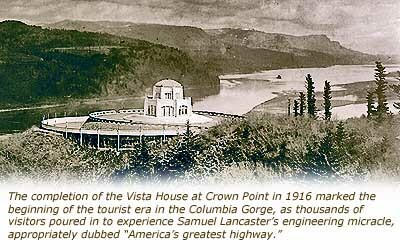 Mount Hood and the Columbia Gorge have been proposed as a national park before, in the 1890s, 1920s and 1930s. The Columbia Gorge was considered for national park status as recently as the 1980s, when the lesser protection of a Forest Service scenic area was enacted. 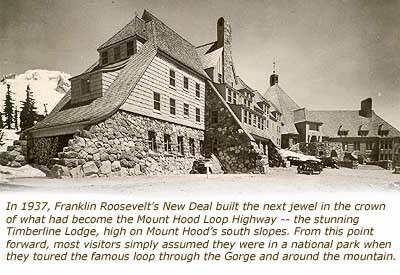 In each of these earlier efforts, the forces that continue to seek commercial exploitation of the mountain and gorge were overpowering, even during the early years, when ski resorts and industrial logging were just ideas on the drawing board. The same challenges face us today, but the arguments for National Park protection have never been stronger. "...to conserve the scenery and the natural and historic objects and the wildlife therein and to provide for the enjoyment of the same in such manner and by such means as will leave them unimpaired for the enjoyment of future generations." The clarity of this mission would help the Park Service repair the damaged landscapes of Mount Hood and the Columbia Gorge, while expanding public access and recreation opportunities. That's why the Mount Hood National Park proposal is centered on a long term mission of rehabilitating the forest and restoring the natural legacy that once existed for future generations. There is also a renewed national movement underway to protect similar, exploited natural gems across the country, so the opportunity to finally give Mount Hood and the Columbia Gorge the protection they deserve is growing. There are also sound economic arguments for national park status, since the proposal could be the catalyst for a new rural economy around the new park. These benefits are also outlined on this web site. It's time to bring this dream to reality, and finally do justice to Mount Hood and the Columbia Gorge. Please join the effort, and do your part to share the dream! Thanks for taking the time to visit! The first step in sharing the dream is to join the campaign e-mail list. Your name will never be shared with other organizations, and you will never be asked for contributions - only to voice your support for this proposal, and to share the dream with others in your community. When you join the list, you'll receive periodic updates on Mount Hood National Park Campaign news and events.